Insubordination is the act of willfully disobeying a superior, by being disrespectful to that superior, or by refusing to follow an instruction given by that superior. As an example of insubordination, a soldier who disobeys a superior officer in the military is likely to be disciplined. If someone refuses to perform an action that is unethical or illegal in nature, however, it is not considered to be insubordination; neither is refusing to obey an order issued by someone who does not have authority to command the individual in the first place. To explore this concept, consider the following insubordination definition. noun. 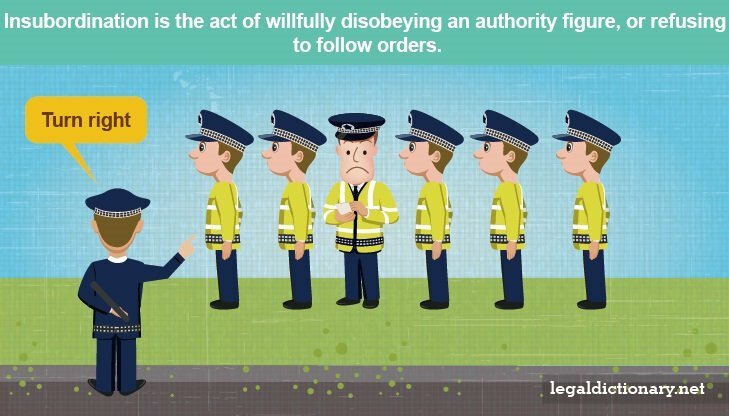 The act of willfully disobeying an authority figure, or refusing to follow orders. Insubordination in the workplace occurs when an employee either simply refuses to comply with an order issued by his supervisor, or when he gets into a direct confrontation with that supervisor. There is a significant difference between an employee disagreeing with what was asked of him, and flat-out refusing to comply. Examples of insubordination include such things as verbal or non-verbal refusals on an employee’s part to complete the work given to him by his supervisor, or taking action to countermand a supervisor’s directions to others. Another example of insubordination may occur when an employee resorts to disrespectful behavior, such as cursing or yelling at a supervisor; being verbally or physically intimidating toward a supervisor; or speaking argumentatively, either directly to a supervisor, or to his colleagues about a supervisor. Insubordination in the workplace can have severe consequences, including termination, as the employee’s refusal to work is a direct breach of the employment contract to which the employee agreed when accepting his position with the company. An employee can, however, refuse to comply with a supervisor’s directions if they are to engage in some illegal activity, or if the supervisor is attempting to provoke or harass the employee. Simply not agreeing with a supervisor’s directions, or feeling they are unfair, does not give an employee the right to disregard the instructions. An employee who is asked to do something illegal, or who feels he is being baited into a fight or argument should report the problem to the next supervisor on the chain of command. Because an employee who badmouths a supervisor to co-workers may be accused of insubordination in the workplace, reporting such issues should be done discretely and professionally. An insubordination letter serves as a warning letter to an employee who has defied authority, or acted in direct opposition to commands by superiors. Such a letter specifically describes the employee’s actions, or failure to act, including the instructions given, and the date and time of those instructions. The insubordination letter may go on to quote the company’s insubordination policies, if any exist, and specifically state how the employee is expected to act in the future. Because refusing a supervisor’s order because the employee believes it to be dangerous or illegal is not considered insubordination, many such letters also outline the proper steps to take, should the employee have any questions about, or objections to, tasks he is ordered to perform. An insubordination letter serves as a disciplinary action and warning of future action that may be taken. For this reason, it is common for insubordination letters to specifically state what will happen should the employee exhibit further insubordinate behavior. For documentation purposes, such letters often contain a place at the bottom for the employee to sign and date, confirming his receipt of the warning letter. The purpose of this letter is to advise you that your conduct, in [description of insubordinate behavior], on [date and time of behavior], is insubordinate, and therefore unacceptable. This letter serves as notice that further misconduct, or failure to perform assigned tasks, will be viewed as an unwillingness or refusal, rather than an inability to comply with reasonable expectations. Future insubordinate behavior will result in disciplinary action, up to and including termination of employment. A copy of this letter will be placed in your employment file. You may respond to this letter, either in person or in writing. I have received a copy and am aware of the contents of the foregoing letter. While insubordination may seem like an incident that both begins and ends in the workplace, there are insubordination examples at the Supreme Court level that can be examined for further understanding of the kinds of scenarios in which refusals to obey orders are taken more seriously. Normally, and unsurprisingly, it is the former employee who sues the employer for wrongful termination. One of the more common arguments found in cases of insubordination heard by the courts involves whether or not Freedom of Speech applies to statements that were made in the workplace, or in the course of an employee’s employment. In 2009, G. Berry Shumann, a pathologist who had worked for Dianon Systems, Inc., a company providing diagnostic testing services, for 12 years, refused to support a new version of a cancer screening test. Shumann expressed his concern that the new test had not been sufficiently researched and verified, and that, combined with the company’s plan to institute new terminology, could confuse doctors, and ultimately jeopardize patients’ safety. Dianon terminated Schumann’s employment several months later, Schumann filed a lawsuit against Dianon, in a case that would become a prime example of employment termination for insubordination, and civil rights argument. Schumann complained that Dianon had violated both state law, and his Constitutional rights to free speech, by firing him for speaking his mind. Dianon referred to a prior U.S. Supreme Court decision in the case of Garcetti v. Ceballos, which stated that, when public employees make statements during the course of their official duties, they are not protected by First Amendment right to free speech. The jury decided in favor of Schumann, awarding him over $10 million in damages. Dianon appealed the ruling, however, and the Connecticut Supreme Court reversed the trial court’s decision, holding that Schumann’s comments, which were made directly in the course of his employment, were not protected under the First Amendment. Here, the Court held that Garcetti applies to private employees like Schumann who sue their employers for wrongful termination based on comments they made. The long and short of it was that Schumann was speaking as an employee, not a citizen. The appellate court reversed the trial court’s decision, and sent the case back to the trial court for a new trial based solely on Schumann’s wrongful termination claim. The same day that Schumann’s case was being decided, the Connecticut Supreme Court reversed yet another insubordination case. In 1998, Carmen Perez-Dickson was appointed to be the principal of Beardsley School in the Bridgeport school district, and in December of that same year it was brought to her attention that a white male teacher was allegedly mistreating a student. The student showed Perez-Dickson his red and swollen hand and explained that the teacher had followed him into the bathroom and squeezed his hand so hard around the doorknob that it caused the student’s injury. Perez-Dickson brought the child to the school nurse, instructing her to report the child’s injury to the department of children and families. Perez-Dickson then phoned assistant superintendent, Henry R. Kelly, to explain what had happened, and followed up the phone call with a written letter. As a result, the accused teacher was put on administrative leave. The following month, Kelly called each of the district’s principals, including Perez-Dickson, to his office for individual meetings to discuss their achievements for the first half of that school year. It was in this meeting that Kelly informed Perez-Dickson that her career was at stake, and that she should refrain from “making waves” at the school. She was also told that she needed to “behave,” that if she was going to visit classrooms, she should carry keys with her and jingle them audibly so the teachers would hear her coming. Later that year, after another student reported being abused by another teacher at the school, Kelly blamed the victim, and Perez-Dickson defended the student. Kelly gave Perez-Dickson a “look” but ultimately placed that teacher on paid administrative leave for six weeks. When finalizing Perez-Dickson’s end of the year evaluation, Kelly wrote that she should “adjust her managerial style” in order to improve on her communication, on the staff’s morale, and her ability to identify and resolve issues at the staff level. Perez-Dickson responded in kind that both test scores and student attendance had improved that year. In December of 1999, Perez-Dickson was quoted in a newspaper as being in disagreement with the light punishments that both of these teachers had received. Shortly thereafter, attorneys for the board directed Perez-Dickson to come to a board meeting and discuss whether or not she had revealed sensitive information to the newspaper. Perez-Dickson denied doing so, saying that she had been misquoted. At the end of the 1999-2000 school year, Perez-Dickson was transferred from Beardsley School to Newfield School, a move that Perez-Dickson found to be a demotion since the student body at Newfield was less than half of what she was managing at Beardsley, and she was going to be paid $1,000 less per year. Perez-Dickson later became aware that the district had told a local newspaper that she had sexually abused a male student. In fact, she had been accused of abuse in several newspaper articles. These allegations were later disproved by an investigation. It was at this point that Perez-Dickson had felt like she had enough and filed a lawsuit, alleging that she was the victim of “harassment, discrimination, and retaliation” for her actions in cooperating with the investigations of both teachers, as well as for exercising her free speech rights under the First Amendment. She also claimed that the school district targeted her for her race as an African American, and that she was the victim of “intentional and negligent infliction of emotional distress.” The jury found in Perez-Dickson’s favor, awarding her over $2 million in damages. The school district appealed the ruling, claiming that the trial court had not had the authority, or jurisdiction, to hear the case, and so the verdict should be overturned. The appellate court ruled in the district’s favor, confirming that the trial court had no jurisdiction. Wrongful Termination – The firing of an employee in breach of his employment contract, or in violation of labor laws.